Facebook's Oculus Quest is the World's first all-in-one gaming system built for virtual reality (VR). Facebook today introduced Oculus Quest, its first all-in-one VR gaming system. Offering six degrees of freedom and Touch controllers, Oculus Quest makes it easy to jump right into the action-with no PC, no wires, and no external sensors. Oculus Quest includes the same best-of-class optics as Oculus Go with a display resolution of 1600x1440 per eye, while incorporating a lens spacing adjustment to help maximize visual comfort. And with improved built-in audio, you will get high-quality, immersive sound with even deeper bass. Facebook have over 50 titles lined up for launch, with even more in the works including some of your favorite Rift games like Robo Recall, The Climb, and Moss. Facebook also unveiled Oculus Insight, its breakthrough technology that powers inside-out tracking, Guardian, and Touch controller tracking. This innovative system uses four ultra wide-angle sensors and computer vision algorithms to track your exact position in real time without any external sensors. Insight gives you a greater sense of immersion, presence, and mobility, plus the ability to go beyond room-scale. 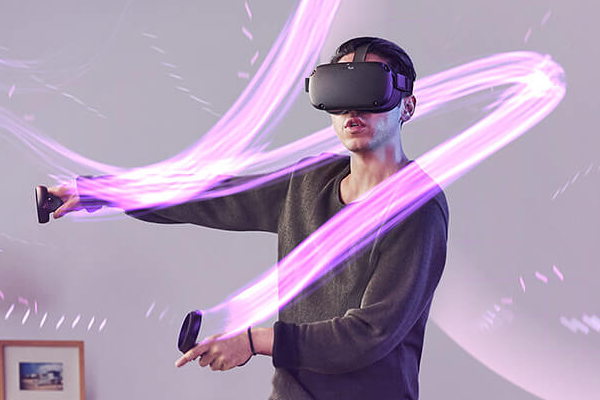 Oculus Quest will launch in Spring 2019 starting at $399 USD for a 64GB headset.